Located in the southern part of Nusa Dua, the Tanjung Benoa is 10 minutes’ drive from the hotel. The beach is renowned for a wide choice of water sports including scuba diving, parasailing, surfing and banana boat rides. For tailor-made experiences or more information, email our Guest Services Team at rsvn.phnd@parkhotelgroup.com. Price: RP128.000 per person (Min 2 persons). Price inclusive of 15 minutes riding on Parasailing, safety equipment, safety briefing, medical insurance, locker, pick up & drop off from the hotel. Banana Boat riding is one of the spectacular water activities to explore the warm and blue seawater. The professional boat captain will ensure you to enjoyable on your adventure with safety equipment and driving. 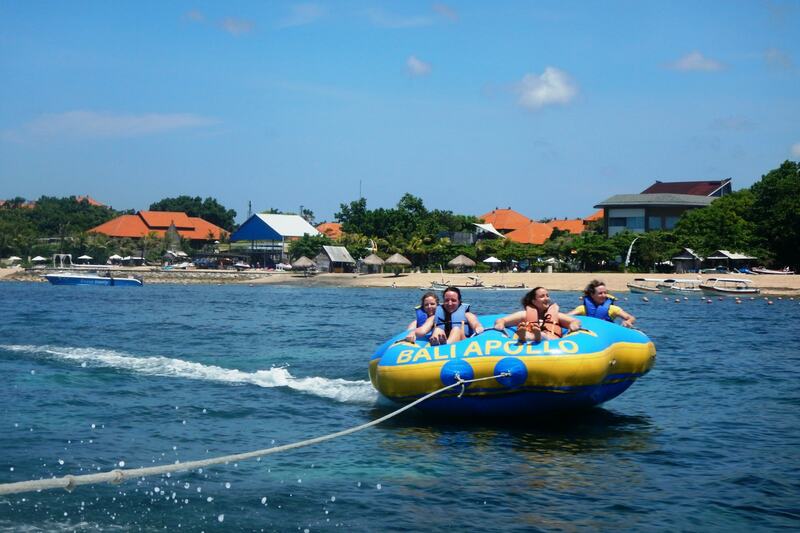 The surprise movement on Banana Boat riding is one of the fantastic moments and gives you unforgettable experience. Price: RP115.000 per person (Min 2 persons). Price inclusive of 15 minutes riding on Banana Boat, safety equipment, safety briefing, medical insurance, locker, pick up & drop off from the hotel. Donut Boat is a new game in Tanjung Benoa. This game is done by sitting in the boat donut, shaken and pulled by speed boat. The donut shape can be played by 2-4 people and it depends on speed boat request. Price: RP128.000 per person (Min 2 persons). Price inclusive of 15 minutes riding on Donut Boat, safety equipment, safety briefing, medical insurance, locker, pick up & drop off from the hotel. Jet Ski is one of the exciting Bali Apollo sport activities by driving 700cc motorize ski to explore the beautiful beach of Tanjung Benoa. This sport is well equipped by life jacket and accompanied by the well experienced guide to ensure your safety and security adventures. Bali Jet Ski is centralized at the beautiful beach with white sand stretch 3 kilometers from Nusa Dua to the peninsula of Bali. Price: RP245.000 per person (Min 2 persons). Price inclusive of 15 minutes driving motorize ski, safety equipment, safety briefing, medical insurance, locker, pick up & drop off from the hotel. Bali Fly Fish is the newest marine sport activity by riding a flat rubber boat which is pulled by a speed boat. It flies to dash against the wind sweeping that it real fly on the seawater. It is a great adventure by flying like fish jumping on the seawater with high boat speed. Price: RP212.000 per person (Min 2 persons). Price inclusive of 3 rounds of ridings, safety equipment, safety briefing, medical insurance, locker, pick up & drop off from the hotel. A glass bottom boat is a boat with sections of glass, or other suitable transparent material, below the waterline allowing passengers to observe the underwater environment from within the boat. The effect is similar to that achieved by a diving mask, while the passengers are able to stay dry, out of the water. Price: RP375.000 per person (Min 2 persons). Price inclusive of 1 hour riding, safety equipment, safety briefing, medical insurance, locker, pick up & drop off from the hotel. Water Ski is an exciting marine sport activity gliding on the ski board to explore blue seawater at Tanjung Benoa Beach. This activity will bring you to the great experience by free run away on the seawater and pulled by the power boat. Price: RP310.000 per person (Min 2 persons). Price inclusive of 15 minutes of skiing, safety equipment, safety briefing, medical insurance, locker, pick up & drop off from the hotel. Marine tourism is very suitable for those who like adventure under the sea and enjoy the life of the fish and beautiful underwater plants. You do not need to know how to swim or have a diving certificate. The helmet is hooked to oxygen tanks, allowing you to breathe while underwater. The helmet may look heavy but it only weights 5kg underwater. Aged 10 years & above can try this amazing underwater tour. Price: RP440.000 per person (Min 2 persons). Price inclusive of 25 minutes diving, safety equipment, safety briefing, medical insurance, locker, pick up & drop off from the hotel. The coolest activity in water sports, the water-propelled jetpack that elevates you 30 feet up in the air, all through the use of controlled water pressure. Price: RP1.025.000 per person (Min 2 persons). Price inclusive of 15 minutes riding, safety equipment, safety briefing, medical insurance, locker, pick up & drop off from the hotel. Flyboard is a type of jetpack/hoverboard powered by proprietary turbojets. A fly board rider is able to fly up to 5 meters in the air or to dive headlong through the water. Professional fly boarders are able to fly up to 10 meters in the air. Learning to operate the Fly board is much easier than you might think. Many tourist are amazed how easy it is to fly. Price: RP830.000 per person (Min 2 persons). Price inclusive of 15 minutes riding, safety equipment, safety briefing, medical insurance, locker, pick up & drop off from the hotel. Hat, Sunglasses, Sunscreen, Sandal, Change clothes, Towel, Waterproof action camera. Activites are available from 9am - 5pm. Free pick up & drop off is only available from 9am - 1pm. 50% of the total tour reserved will be charged if the cancellation is made 3 days before the service date. 100% of the total tour reserved will be charged if the cancellation is made within 1 day before the service date. 100% of the total tour reserved will be charged for no show. Cancellation policy is valid for individual bookings and not valid for group booking. Cancellation policy for group booking will be advised upon the confirmation.